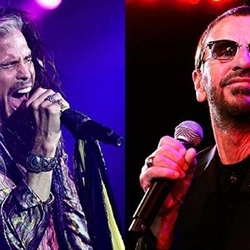 Steven Tyler Got A Special Message From Ringo Starr For His 70th Birthday . Beatles Radio: The Beatles, Solos, Covers, Birthdays, News The Fab 4 and More! Steven Tyler turned 70 years old Monday and got a happy birthday wish from a very famous friend. Beatles drummer Ringo Starr raised a glass to his fellow Rock and Roll Hall of Famer, who formed Aerosmith in Boston back in 1970. “THIS WILL BE THE BEST BIRTHDAY EVAH,” Tyler replied. Tyler had to cut his South American tour short last year due to “unexpected medical issues.” But that hasn’t slowed him down in 2018. Last week Tyler announced he would be doing a summer tour with Nashville’s Loving Mary Band in North American and Europe.